A friend asked me to visit her. 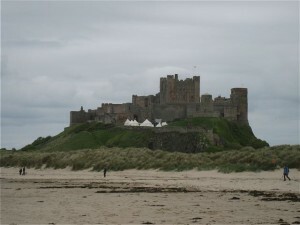 She lives in one of the 16 or so apartments at Bamburgh Castle, on the north-east coast of England. “Always take a hot water bottle when staying in a castle,” I’d been advised by another friend. 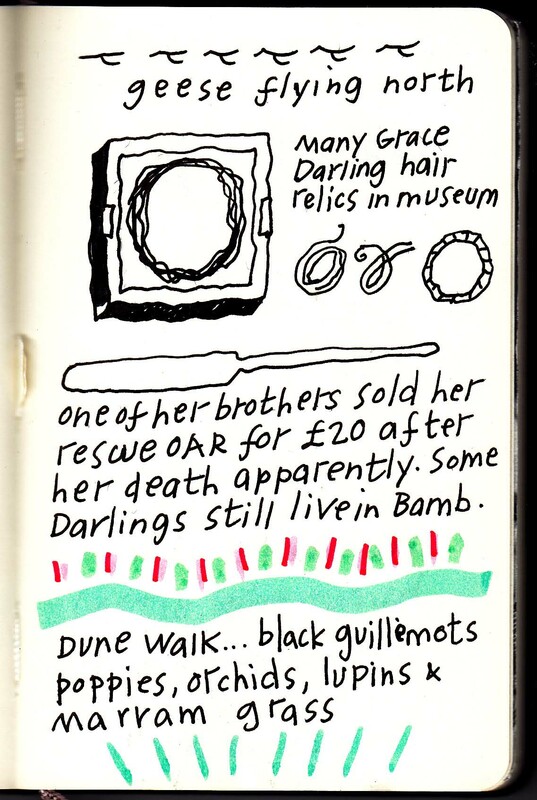 She was right, especially if the castle is perched on a rock overlooking the north sea. Below my bedroom window cannons lined the castle walls, and Longstone lighthouse twinkled away to the south in the Farne Islands. This had been home to young 19C heroine Grace Darling, the lighthouse keeper’s daughter, who rowed out in a storm and rescued 5 shipwrecked passengers. 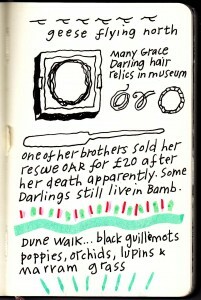 There’s an excellent small museum dedicated to her, and several Darlings still live in Bamburgh village. 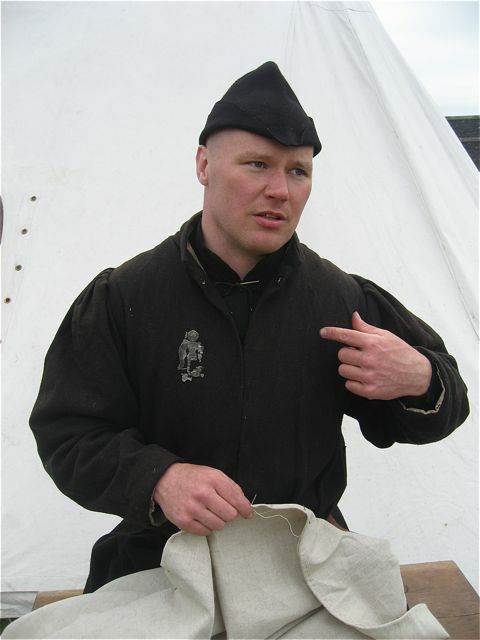 O’s flat had once been the home of Suffragette Norah Balls, a suit of armour called Henry stood guard outside my room, and the castle was being besieged, in the nicest possible way, by some Wars of the Roses historical re-enactors who’d set up their camp below the castle ramparts. 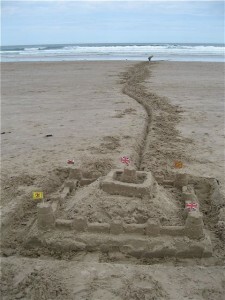 O. asked me to take part in the annual Bamburgh sandcastle competition with her. The sun shone through squally skies, the wind howled, and extended families camped out on the sandy beach. We had all the right equipment – buckets, spades, sandwiches etc, but one essential was missing – we didn’t have a child with us. 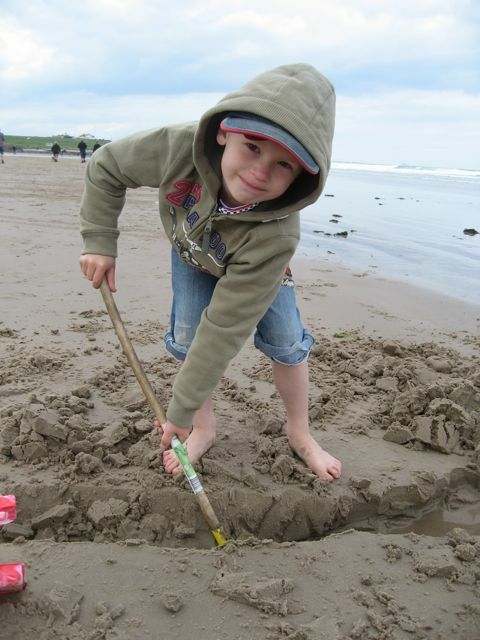 I borrowed one, a delightful young helper called Tom, who worked for several hours without complaint, digging a channel for the incoming tide to travel up to our moat. We didn’t win, but I was transported to seaside holidays from my childhood, full of adventures and of course, the cold and wet. 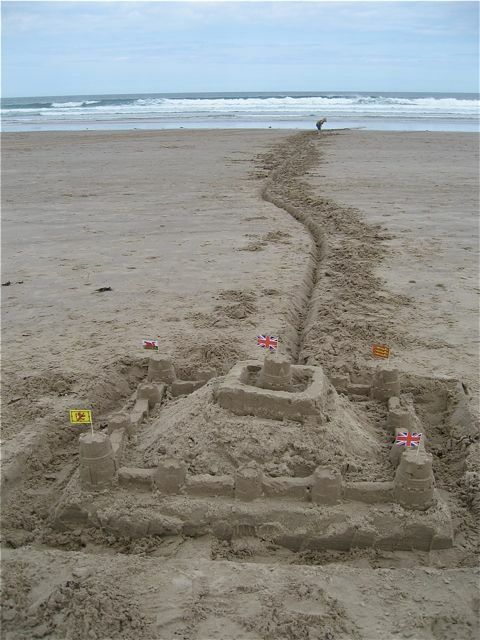 This entry was posted in Travels and tagged Bamburgh, Bamburgh Castle, castle, Clarence House Re-enctors, competition, Farne Islands, flags beach, Grace Darling, Grace Darling Museum, heroine, lighthouse, Longstone lighthouse, museum, Norah Balls, Northumberland, sandcastle, sandcastle competition, seaside, Suffragette. Bookmark the permalink.